Flood Insurance in Lynn Massachusetts - David E. Zeller Insurance Agency, Inc. 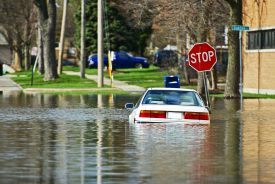 If you have ever heard the term "flood zone," you may think that it refers to locations that are particularly vulnerable to flooding. Wherever you live in the USA, you live in a flood zone. While your area may have a lower chance of flooding than a coastal area or a location situated near a body of water, your area could still experience flooding. A very dry part of the country can be susceptible to flash floods; hilly locations may be harmed by drainage; snowy locations may suffer from heavy snow thaw; other areas may suffer deluges or flooding due to a heavy rain season which has soaked the surrounding soil. So, if you've insured yourself against fire, wind, and other causes of loss, it certainly makes sense to also protect yourself from the potential of a flood loss. Why worry when disaster coverage is available? You may believe that even if you suffer from a flood, your loss may be taken care of when the government declares your location to be a disaster area. However, you're still taking a couple of large risks. First, your flooded locale may not be deemed a disaster area. Second, being designated as a disaster area is not a bargain. Disaster area status only gives citizens access to government disaster loans. If you qualify for assistance, you have replaced insurance protection with an obligation to pay off a large, long-term loan. Is it worthwhile to gamble on an opportunity to pick up more debt? You'll find flood insurance to be a cheaper and much more valuable alternative. Don't be "all wet" You don't have to leave yourself unprotected. We can help you with detailed information on the National Flood Insurance Program. You can also ask for help in getting the coverage you need to "keep dry" and secure in the face of a flood.